Ed Boks’ STAR Program makes sure animals like Ziggy get the care they need! Although the Yavapai Humane Society (YHS) has been providing animal shelter services to our community for 43 years, it was only five and a half years ago that YHS embraced what we have come to call our “no-kill ethic.” We define this ethic as applying the same criteria to determining a homeless pets’ fate that a pet owner or conscientious veterinarian would apply to a beloved family pet. That is, healthy and treatable animals are not euthanized (killed) simply because of a lack of resources. Once this life-affirming ethic was implemented, the practical consequences immediately began to fall into place. Embracing and practicing the no-kill ethic has resulted in our community becoming the region in the United States for dogs and cats – for five consecutive years. Euthanasia/killing has been effectively eliminated as a tool to control pet overpopulation in our community and overcrowding in our shelter. Killing has been replaced by a robust low-cost spay/neuter and pet identification (microchip) programs. Spay/neuter programs reduce the number of unwanted pets and pet identification programs allow for the quick return of lost pets to their frantic owners. A perfect example of an animal benefiting from the YHS no-kill ethic is Ziggy – a 2-year-old intact male Tibetan spaniel mix. Ziggy was found by animal control on Dec. 1. 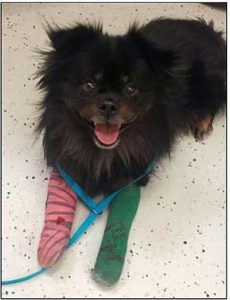 He was abandoned by his owners with an apparent broken leg. Upon arrival, the YHS medical team found Ziggy had suffered severe trauma. X-rays revealed two broken legs: his right front leg had fractures of the radius and ulna and his left front leg had metacarpal fractures. We splinted both front legs and started him on pain medications. YHS veterinarian consulted with a private practice veterinary orthopedic surgeon. The decision was made to transport Ziggy to a local veterinary hospital in Phoenix where Ziggy was examined and immediately scheduled for surgery. His multiple fractures were repaired with plates, screws and a tension splint. Ziggy’s recovery is expected to take 6 to 8 weeks and is made possible thanks to YHS’ compassionate foster care giving volunteers. The orthopedic surgeon felt the fractures could be old injuries suggesting criminal cruelty and neglect may have been involved. Typically, the cost for this surgery would exceed $4,300; however, the private veterinarian graciously agreed to charge YHS only $2,800 for this lifesaving surgery. Ziggy is now a STAR Animal. STAR (Special Treatment And Recovery) is a donation funded program designed to ensure animals in critical need of medical care beyond the scope of the YHS budget are not denied the care they need to survive. These animals are sadly routinely euthanized in many other shelters. If you would like to help animals like Ziggy please make sure your local shelter has a STAR Program you can make a tax deductible donation. Your donation will help ensure your local shelter has the funds available to help the next rescued animal in need of life saving medical care.